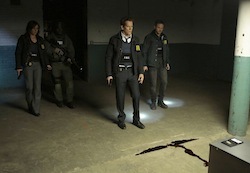 THE FOLLOWING’s “Boxed In” took its title a little too literally. In tonight’s new hour, Clarke was taken hostage, as Ryan, Mike, and Max were given an ultimatum: tell the truth about their roles in the death of Mark’s family, or Clarke would pay the price. While they opted not to say anything, Clarke told the truth, and the video of his confession was released. How will Clarke’s death impact the team going forward? Alexi Hawley: I think it has a profound effect on them; definitely in the short term. It’s such a blow: this was a character they cared about, and he was killed in such a horrific way. But also that it was tied in, fairly or unfairly, to actions they took at the end of last season puts some of the onus on them. They’re not responsible for his death, but what they’re being accused of is not necessarily false. It does shake them. Max, [who] is the moral center, is very shaken that something she helped cover up is at least tangentially responsible for Clarke’s death. Mike, who is so determined to kill Mark for Mark killing [Mike’s] father, it only hardens him. Ryan, who was in a happier place, this is the beginning, I think, of that starting to be stripped away. Both the sins of the past and, moving forward, what he’s willing to do to catch the people responsible for it. Since the tape was released, what are the implications for their careers? AH: There are things that do come up in the first third of the season, above and beyond that, that ultimately play a big part as well. It does have ramifications of them; more emotionally and personally than professionally, though the questions definitely are uncomfortable, and they are put on the line because of it. There was a sequence that led the audience to think Ryan would be going to see Joe, but instead he saw Dr. Strauss. At this point, what can you say about when we can expect Joe? AH: I don’t want to spoil it. the audience should know he does play a very vital part in the season, and is in a fair amount of the season. We definitely do get to him, and he does play a big part. But I don’t want to give too much away. What else can you say about the next batch of episodes? AH: What’s really going on with Mark, Daisy, and Kyle does continue to grow and get more dynamic. There is some very dynamic stuff that’s coming up. We did approach this season in three five episode arcs, and so the first five [does] grow to quite a climax. What’s been great so far is episode five, being the last of the first arc feels like a finale. And episode ten feels like a finale, too. And 15 should definitely feel like a finale, too. [Laughs] What’s great is we can burn through story, we can build things up really high and blow them up, and then spin off in not completely new directions, but the repercussions of what happens in those first five carry on into the next five and so on. It’s a big season. There’s a lot that goes on, and every week is a like a movie.